I heard about this workshop on the Transitional Genealogists mailing list and thought it would be worth sharing. 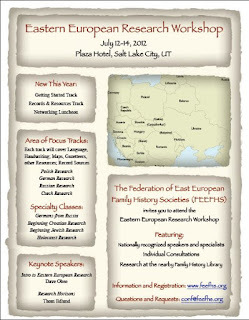 I try to highlight many different educational opportunities in genealogy. 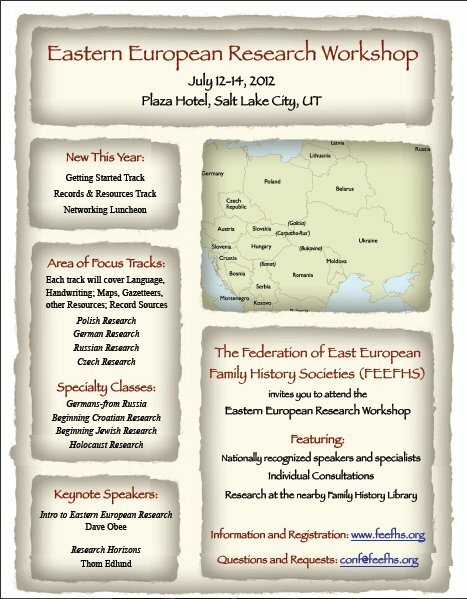 "The early-bird deadline ends on June 1st for the Eastern European Workshop sponsored by the Federation of Eastern European Family History Societies (FEEFHS). This year's workshop features tracks on German, Czech, Russian, and Polish research, in addition to a handful of specialty courses and a Records and Resources track. The workshop environment allows sufficient time for research at the nearby Family History Library in addition to consultations with the instructors. Since this program offers something for both beginners as well as advanced researchers, it is a great way to get started in a new area, build on existing skills, or work on a brick wall."